Buy online 150 sq. ft. 5 ft. x 30 ft. x 1/8 in. Acoustic Underlayment for Ceramic Tile and Natural Stone ADTF150 and leave review or share with Your friends. Acoustical sound control and anti fracture rubber underlayment for ceramic and natural stone flooring. 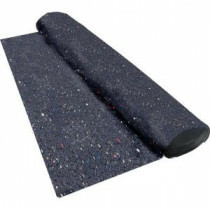 Shock absorbing and impact sound reducing pad that is strong flexible rubber. Stops noise transfer.